Episode 2 was all about our new podcasting studio. We introduced our studio to fans during our live streaming show, and we wanted to recap our studio, the technology, and costs, as well as the potential uses. If you are considering getting into podcasting, check out how we built a high-quality studio for a fairly decent price! The studio that we built is really flexible and relatively affordable, but at the same time, it is a high-quality podcasting studio. If you follow PTZOptics and our sister company StreamGeeks you might have noticed that we always try to be on the bleeding edge. In this space, we already had a 10-camera broadcasting/live streaming studio and we wanted to be able to simply walk from our broadcasting studio right down the hall into our podcasting studio without cutting the stream. We are able to achieve this because all of the technology is connected over NewTek NDI. Firstly, we’ve got a gigabit network switch. For those of you out there who don’t know, that’s a giant network switch. We’ve got 48 ports on it, and we’ve got another one with 24 ports. Pretty much everything that we use today is put on the local area network. It’s an ethernet port, BOOM it’s in there. Now it’s accessible on our computers to different broadcasting systems, and each laptop becomes a connected hub and all the sources on that computer are available to all the other machines. That has allowed us to simply pop an Intel nuc in front of our studio and plug an audio mixer into it and basically make a podcasting system that’s connected directly to our broadcasting studio (we are also live streaming while we podcast as well). Next, we have an audio mixer that is taking in four Sure SMB microphones that are really high quality. Those microphones are coming into a mixer that has four auxiliary outputs. And those auxiliary outputs are feeding our headphones. Our headphones are all receiving a mix of audio that is unique to each podcaster so that we’re not hearing ourselves back in our headphones (which can be really annoying if you’ve ever done a podcast). Mix Minus is essentially the way that we are able to take five inputs – we have four microphones and an audio processor, our Intel nuc, sending it back into our mixer – and each headset gets its own unique mix which is all the audio, minus their microphone. It’s pretty cool. The mixer is plugged in USB to our computer, and it’s brought into our video production software so that we can pull it in during our live show during our Twitch stream. Throughout this whole process, we’re also recording our podcast on Audacity. What are some things that we noticed when building this new setup over here that we found very helpful? It was pretty fast, Two days to set up and put together. Something that was really helpful was our number system. We basically just cut up little squares, little tiny squares, numbered them, and taped them to each one of the pieces of hardware. We taped each of them to the cables and each one of the pieces of hardware. So when we were plugging everything in, everything just went through smoothly, we were so organized. I couldn’t see it working with mix-minus without all that. The other thing that helped a lot with our quality in general (and this is a podcast about podcasting) was a VST3 plug-in. But that is essentially a virtual studio technology and what that does is that allows us to do live audio processing and we are boosting our audio to sound even more radio-like than ever before. We’ve been using those plug-ins for a couple months now, and they’ve really helped the audio. We’re using three or four different ones from a company called Waves, waves.com. And I started out with a local plug-in which was $100, it came with like 6 or 7 plug-ins, and that was a great way to get started. And we found one called Renaissance X. An Intel nuc i7 processor: $800. Turn it on, launch up Vmix or Wirecast (we’re using a video production software) not a podcasting software. Total: About $3000 for a quality podcasting studio. Another exciting thing about our studio, is we are going to be opening it up to the public to use for $100/hour. It’s something that we’re going to do as a case study to show what businesses could do. It might only be temporary, but we will let you know what happens! 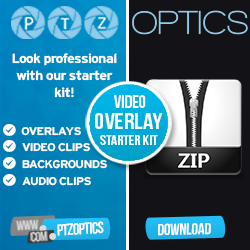 Control PTZ Cameras with Ableton or any DAW here. How to control PTZ cameras with MIDI here. Real time audio processing with VST3 plugins and how to enhance vocals in your audio here. Tips for live streaming a musical performance here. Learn how to integration PTZ camera control into Avid Pro Tools here.